To orientate oneself in space, one must first of all know in which direction one is looking with regard to a known reference. The basic partition of the space around oneself is thus based on the four sides instinctly felt and described in all languages, in front and behind, left and right of the own body. This defines a first partition of the circle in four parts (1/4). Away from home, a possible reference may be the sun's position during the day: rising (East), zenith (highest position) at noon (South), setting (West). Although this reference system varies during the day and the seasons, it is quite reliable ... in sunny countries. The winds blowing always in the same direction at the same time also constitute a reference system. But the only never changing reference (in a man's lifetime) is the North star (in the Northern hemisphere). One of mankind's greatest achievements was to realise that magnetized metal points to this star. From this position, a circle around one's own position could be defined and the other directional elements like the sun's positions were integrated with precision in this circle. These form the basic Cardinals. The circle thus divided into four parts, each quarter can be halved in its turn (1/8) and so on until we obtain sectors measuring 1/32 of the full circle. These are called rhumbs. The result of this is what we call the rose of the winds. It used to be beautifully drawn on early compasses and maps. 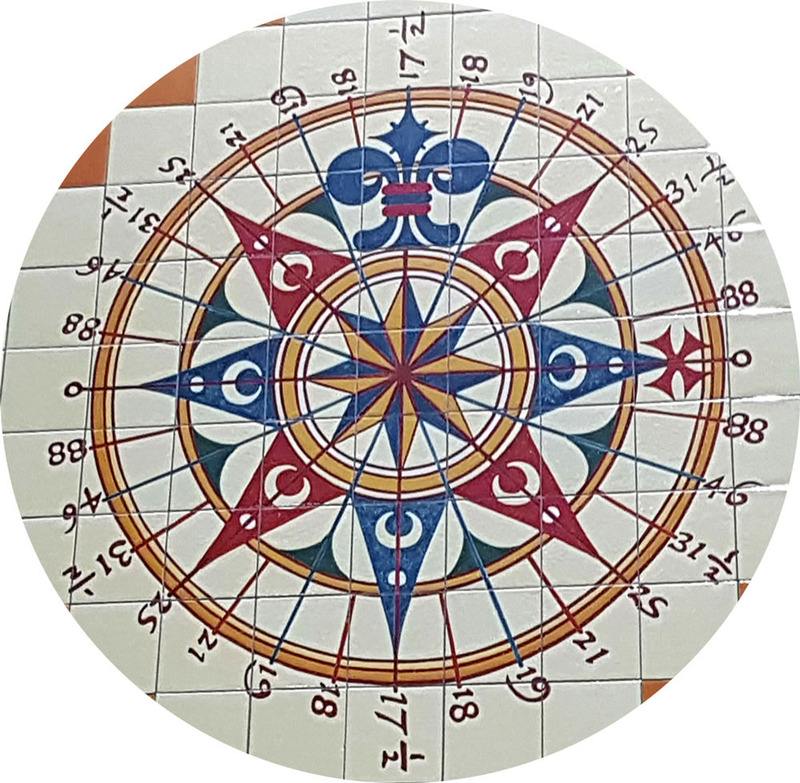 If the compass rose is large enough, it is still possible to divide all divisions again by two so that the precision is a 1/64th part of the circle. We will see this number later again (see MILS below). However, the great difficulty to steer a boat on a moving sea makes such a precision unnecessary. Furthermore, the circle can be divided into other units resulting of mathematical calculations (see also the traditional Chinese divisions). 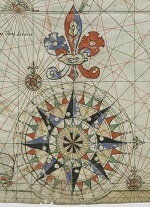 Concerning the division in 12 winds, read The Riddle of the Compass by A. D. Aczel (bibliography). This word with unclear etymology (does it come from "rhombus", the form of the arrows on the picture at right?) designates a subdivision of the circle. The rose of the winds is divided into 32 points also called rhumbs, each one being equal to (360/32 =) 11° ¼ (15'). Each point was also divided into half- and quarter- points i.e. 128 in the whole. Designating a steering direction in this system was cumbersome and could lead to errors. In the late 19th century, figures were first introduced to avoid ambiguous designations (read in Wikipedia, The points of the compass, 4 - Half- and quarter-points). Rear Admiral Wharton, Hydrographer of the Navy, issued as early as 1893 charts featuring compass roses also graduated in degrees and Thomson (Lord Kelvin) patented his new compass card graduated in 360° on the rim. 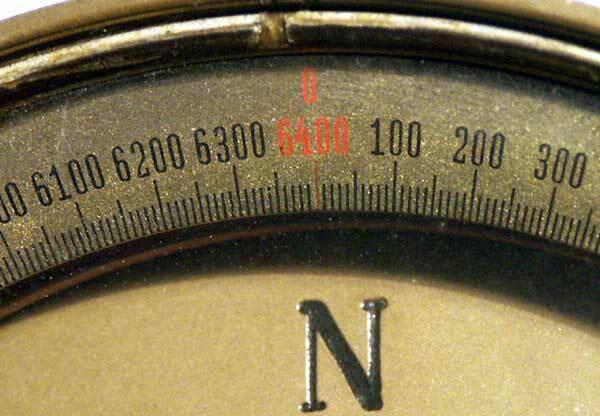 Germany introduced the 360° compasses in 1941. 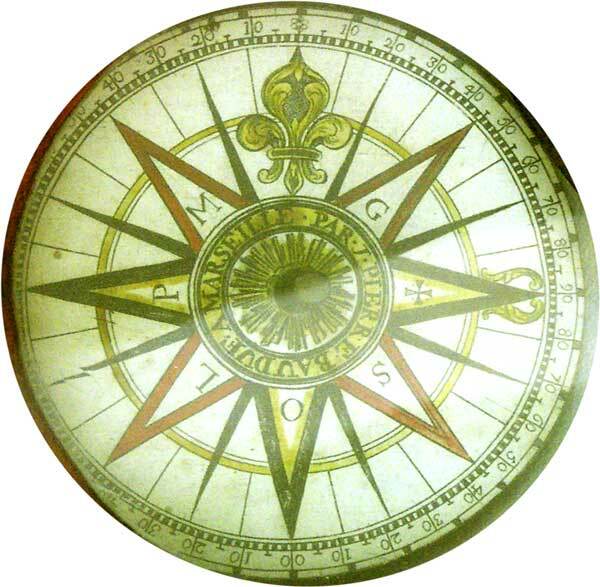 Some 16th c. maps depict a conventional rose featuring the usual division in rumbs and around them four scales with values as follows: (example) West and East facing a zero (or two zeros for infinite), North and South facing 17½, and inbetween the figures 18, 19, 21, 25, 31½, 46 and 88. These figures are distances in "sea miles" (1/20th of a degree, i.e. 3 nautical miles or 5.5 km) that a ship must sail to cover a distance corresponding to 1° of latitude depending on the angle between the ship's heading and the equator. The lowest figure (17½) corresponds thus to a course along a N-S axis, the highest (88) represents the angle near an E-W-axis. 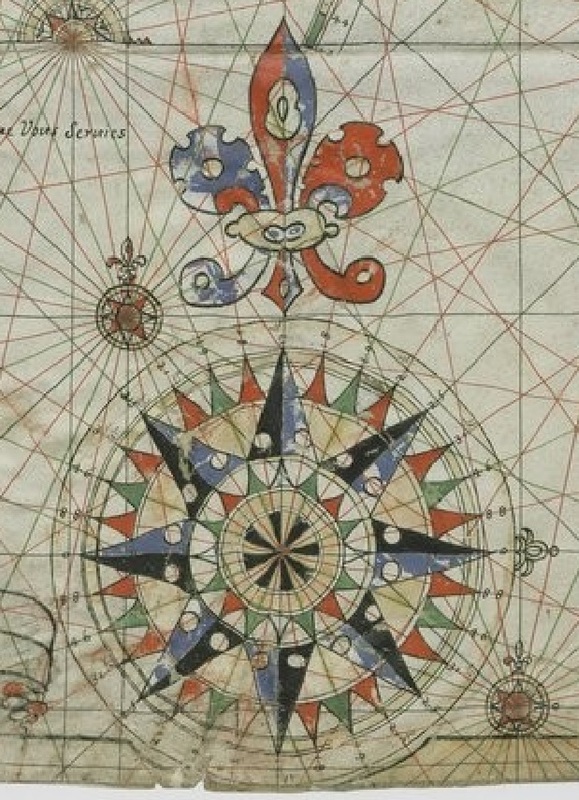 Such roses of the winds are also described in Les premières oeuvres de Jacques Devaulx (Le Havre, 1583) by a French cartographer (link to the online French Bibliothèque Nationale (GALLICA). A facsimile with explanations in English was published under the title Nautical Works (ISBN 3836539233). Pic. at r.: Denis de Rotis, 1674, Carte de l'Atlantique nord, source Gallica. The degree ist the most common division system of the circle. 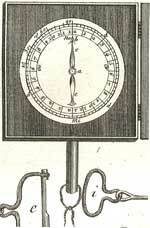 It was first used by Ptolemy in his astronomy book called Almagest. One degree is a 360th of the full circle. It is related with the number of days in one full solar year that can be observed by the apparent movement of the sun above the horizon (365,25). The number 360 which was known in many early civilisations is very useful in maths since it can be divided into 4 quadrants (right angle). A particular type of division used during a long time on big survey and on small pocket compasses was the quadrant. Each quarter of the circle is numbered separately, starting with zero at North and South. Directions (bearings) were read and noted with only a small figure starting from the next cardinal and by indicating the sense. Example: 190 degrees is thus said 10 deg. SW. The grad is a unit of plane angle, equivalent to 1/400 of a full circle, dividing a right angle in 100 parts. It is also known as gon, grade or gradian, gradient or radian. One grade equals 9/10 of a degree or pi/200 of a radian*. This is the application of the metric system on the division of the circle defined in France at the time of the Revolution : this division system was used for all geodesic measures of France (see examples like MERIDIAN or STOPPANI in the category Survey Compasses). The gon was the official measure unit in the French Army since September 11, 1921 (Bulletin officiel). In 1899, trials at sea conducted were onboard ships carrying metrical compasses, maps etc. 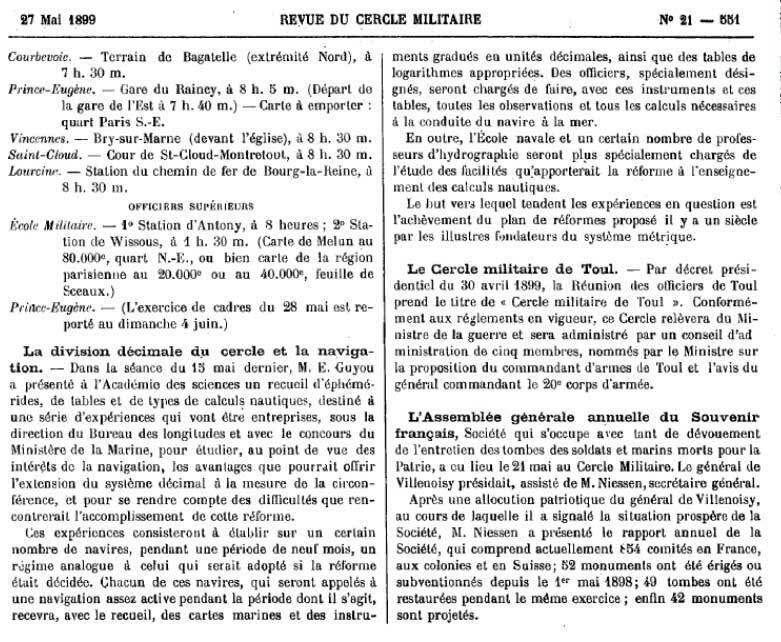 (see Revue du Cercle Militaire, issue no. 21, p. 551 - 27 May 1889). 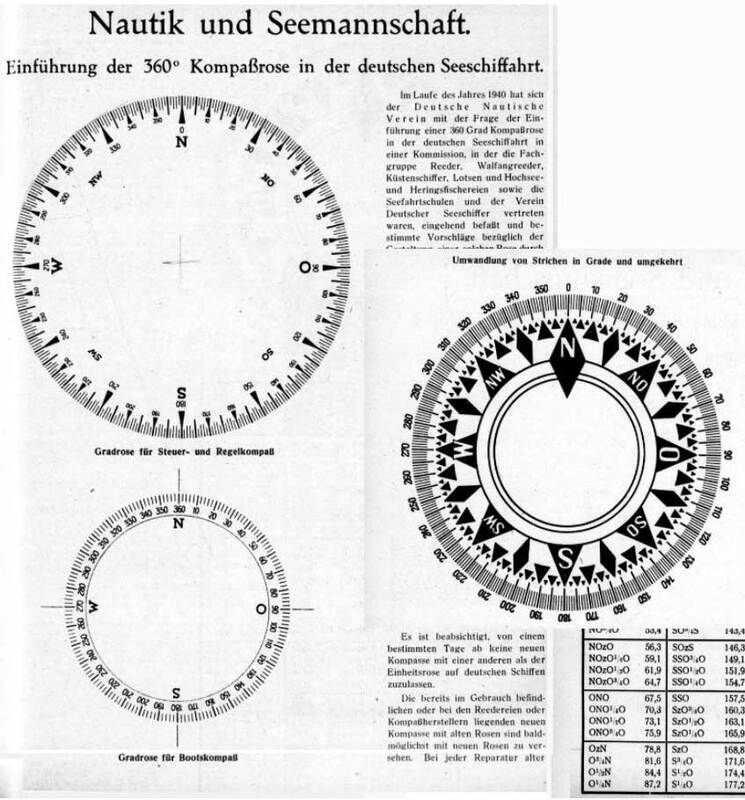 French, German and Austrian miner compasses featured a graduation in 24 hours or twice 12 hours (with latin cardinals - link to pic.) until the mid 19th century, later together with a 360 deg. division (ex. : BREITHAUPT, ROSPINI, ROST, STUDER. with a description in French on the website of BnF/Gallica, read the para. Platteau, p. 213-214. 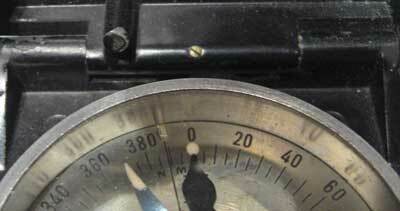 - Description of still older survey compasses in the book: Boussoles des mines des XVIe et XVIIe siècles (last paragr. on p. 620). - Explanation: "The hour (Latin. hora) used to be the unit on miners compasses. One hour being the 24th part of the circle (or a full revolution of the Earth), it equals (360/24) 15°. This unit is divided into halves, quarters and so forth down to 1/16 (i.e. 96 units in a right angle). Relative precise measurements could be done by using fractions. 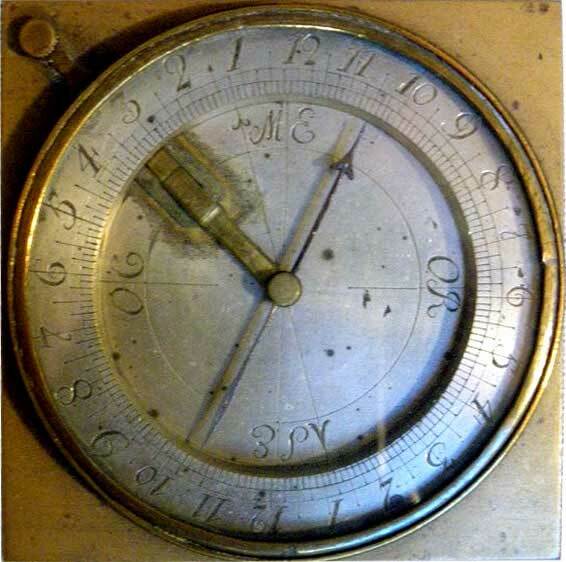 It has disappeared on miners compasses but the graduation featuring twice 12 hrs is still in use on surveyors compasses*." Read also a comprehensive explanation on the website www.trademarklondon.com: The real Truth about Mil Dots. The angular mil is commonly used by military organizations. Its relationship to the radian gives rise to the handy property that an object of size s that subtends an angle theta angular mils is at a distance d = 1000 s / theta. Alternatively, if the distance is known, we can determine the size of an object by s = theta d/1000. The practical form of this that is easy to remember is: an object located 1 km away and seen within angle of 1 mil measures about 1 meter (2 pi/6.4 = 0.98 m to be more precise). Another example: an object situated in 2 km distance and seen within an angle of 100 mils is 200 meters long. Even on large compasses, the scales are only graduated in steps of 10 mils. Marching compasses feature scales in 100 mils (divisions: 0-64, see pictures of examples below). Comment: In the general case, where neither the distance nor the object size is known, the formulae may be of little use. In practice, sizes of observed objects are known with reasonable accuracy since they are often people, buildings and vehicles. Using the formulae, distances of the objects can be readily calculated without a calculator. In military terms, distances are of course essential for artillery bombings and estimations of journey times. - "M" for millième (Mils). The official symbol (at least in France) is the letter "m" with a bar making an angle of 30 degrees across it : . This letter "m" was chosen for the French word "millième" (i.e. "thousandth"). In the angloamerican world, the word MILS ist used (see the BRUNTON M2 compass in the category Survey Compasses). On older German compasses and in their relevant documentation, the symbol used was an apostrophe (') or an horizontal bar placed as exponent. 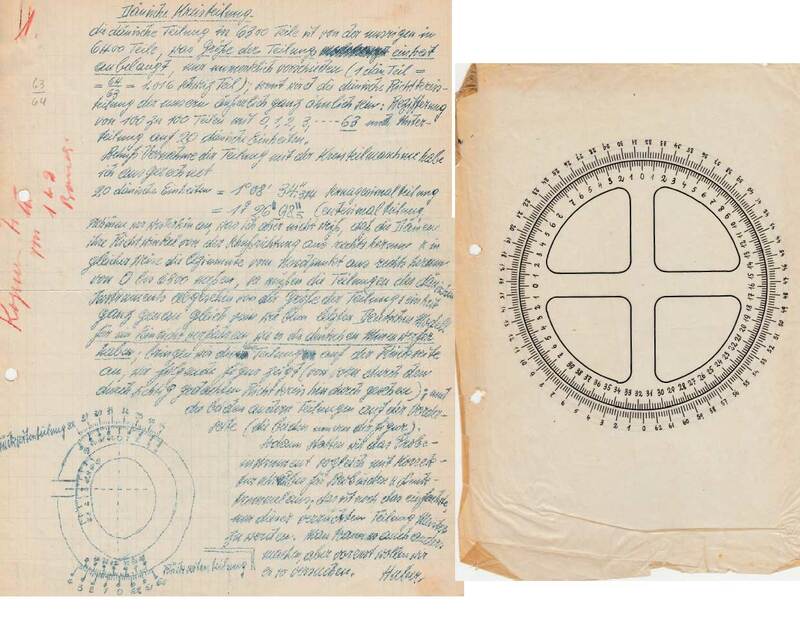 Example in table above: rear side of a German artillery compass - unfortunately without maka er's name (click on picture to enlarge). The mil being one thousandth of a radian, the exact figure would thus be 6283. The more practical figure used in the Western world (NATO) is 6400. Such a precision is not achievable on hand-held compasses. The last two digits are thus not indicated. This is the division one can see on the western military compasses (0-64). 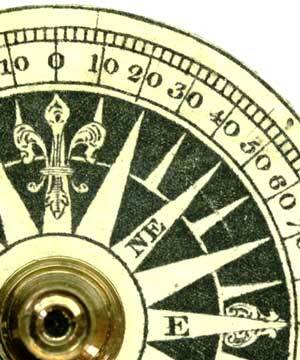 It used to be indicated counterclockwise on older German Bézard compasses for instance. 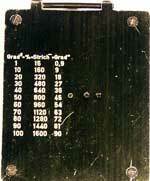 Until 1933, the zero/6400 marking was at the South cardinal point and 3200 at North. The Soviet Union and Eastern European countries (Warsaw pact) used the lower practical figure 6000. 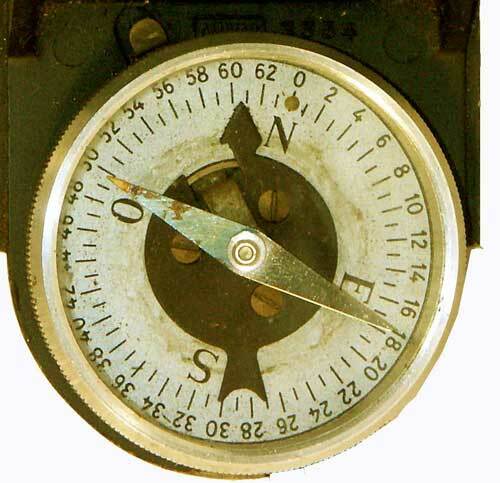 This is the division 0-60 seen on Russian, Yugoslavian, Hungarian, Romanian, Czech and Polish compasses. China, Vietnam and Arab countries also use it. This division system was used by a French Artillery officer called Emile Rimailho* for a gun type that he had developed in 1904 and dubbed 155 CTR (court à tir rapide / short barrel, fast shooting). This gun was the ancestor of the anti-aircraft FLAK guns. This unit is therefore sometimes called in France "millième Rimailho". The (neutral) country Sweden used until recently a third system with 6300 MILS (streck in Swedish - ex. : Bézard, LYTH, NIFE and SILVA). During World War I, the Swiss BÜCHI developed a special version of its artillery aiming device called Sitometer featuring a 6300 MILS division for Danmark's Army and called it Danish division. NOTE - Håkan Sahlin, Major (retired) in the Swedish artillery sent us the following information : The survey units are using theodolites with gon (400 grades) divisions whereas the observers and the fighting units used the swedish unit 'streck' (6300 mils). * French officer and engineer (born in Paris 1864, died 1954 in Pont-Erambourg, département Calvados). The division in angular mils makes it possible to calculate a distance even when no parameter is known. Major Rudolf Gallinger serving in the imperial Austrian Army had known very well the inventor Johann von Bézard during WW I and he wrote in the years 1920-1930 several manuals for "tourists" (see definition) and soldiers. 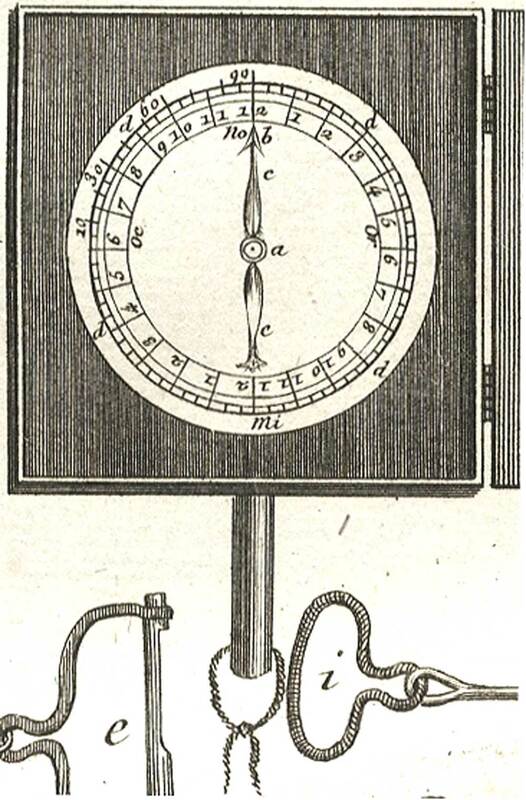 He described in them how to use this compass in order to compute the distance of an object and the size of objects at a known distance. - b) moving sideways from line of sight to the target. X = Z x s / d = 100 x 91 / 8.2 = 1100 m.
Add then the value of the first move from A to B (100m) to obtain the distance A-c (1200m). NOTE: It is also possible to go back from the observation point. One must then substract the moving distance. In the present case only one additional point is necessary: it should be situated 100 mils sideways of the line of sight (A-B) to the target. One goes a certain distance in the direction of the additional aid point and measure again the angle between c and the target. With these distance measures and angle values, one can calculate the distance to the target with the same formula as with method a). One can also estimate a distance without computing it. For instance the broadth of a river. The method is as follows: One must draw hereto a sketch with a certain scale. First, chose an easily recognizable object on the opposite bank and take a bearing of it against the next cardinal point. Move then sideways by a certain distance (100 m for instance), at a 90 degrees angle and take again the bearing. The difference between both is the angular value of the line B-C that is to be drawn on the sketch. Since the distance A-B is known, one can measure on the sketch the length of the line A-C at the cross point with B-C. 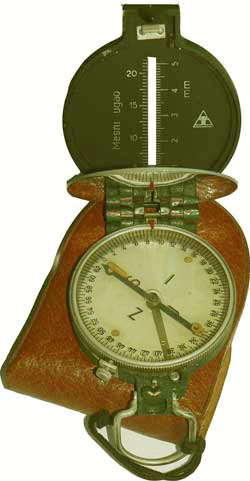 Some compasses have one or several rulers located besides the sighting slots in the lid (picture right: TELEOPTIK M49 - click to enlarge). 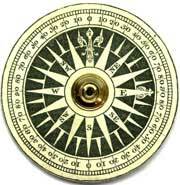 These compasses must be held at a certain distance from the eye, for example 25 cm or 50 cm. To this purpose, the compass' lanyard has a knot at the right place, that you can hold with one hand against your cheek while holding the compass at eye's level with the other hand. The size of the observed objects is also measured in mils. The Universal Bézard-Kompass (UBK) had an additional system: attached to the compass was a foldable ruler comprising two halves of 8 cm each, i.e. 16 cm when fully open. 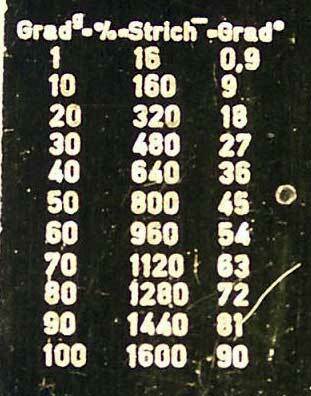 The first 10 cm were also a division in mils and read: 0-20-40-...-200-11-12...!